LEICESTER City showed the first signs of nerves last week in their hunt for the 2015-16 English Premier League title. The controversial 2-2 draw with West Ham United, which was marred by some baffling refereeing, allowed Tottenham Hotspur to close the gap to five points. Online bookmaker Sportsbet.com.au still has the Foxes as $1.45 favourites to lift the trophy, but Spurs have moved in to $2.88 after their demolition of Stoke City. 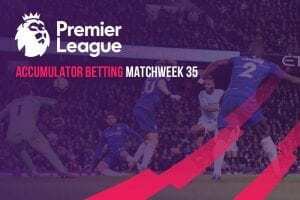 While Arsenal ($151) remain an outside chance, pending the result of their catch-up clash with West Brom on Thursday, one more point for Leicester would mean lights out for Manchester City ($501). Already lost in the dark are Aston Villa, whose 1-0 loss to Manchester United saw them relegated from the English top-flight for the first time in over 100 years. Precisely who will join them in the Championship next season is still anybody’s guess, however, after the other two teams in the bottom three claimed rare victories to keep their survival hopes alive. Newcastle United are firm $1.14 favourites to go down, but Norwich City ($1.40) have leapfrogged Sunderland ($1.67) in the EPL relegation betting after their defeat to the Black Cats last weekend. Now let’s check out the major match markets and value picks for week 35 at Sportsbet – one of our top Premier League betting sites. The Citizens are unbeaten in four EPL outings, but the 1-1 draw with Newcastle in midweek all but killed any slim hopes they had of snatching the title. 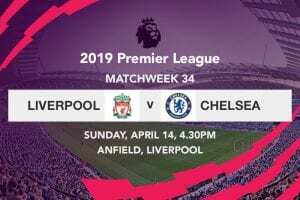 While a top-four finish is not yet in the bag, they may rest a few of their big names this weekend in preparation for their upcoming Champions League semifinal against Real Madrid. It’s all gone wrong for Stoke, who have managed only one win in their last six matches. They were well and truly outclassed by Tottenham on Monday night, failing utterly to contain Harry Kane and company. Historically quite tidy at the back, the Potters have now shipped 10 goals in three games. Bet on the Man City vs. Stoke first goalscorer at Sportsbet.com and get a cash refund up to $50 if your player’s team fails to score. The Reds’ resounding win in the Merseyside derby on Wednesday came at a cost, with in-form striker Divock Origi suffering an ankle injury under a spiteful challenge from Everton’s Ramiro Funes Mori. The means a likely start for Daniel Sturridge, who scored one of four unanswered goals against the Toffees. Jurgen Klopp’s men have lost only one of their last nine Premier League games, winning six. Also finding some much-needed touch are Newcastle, who backed up their 3-0 trouncing of Swansea with a vital point against Man City in midweek. If other results go their way, a win this weekend could lift the Magpies out of the drop zone for the first time since February. That’s a tall order for Rafa Benitez on his Anfield homecoming, however, as Newcastle haven’t won at Liverpool since 1994. The Premier League’s perennial escape artists did their survival chances no harm at all with last week’s crucial win over Norwich. While that was Sunderland’s first victory since stunning Manchester United back in February, they’ve picked up points in five of their last six. Jermain Defoe’s form in front of the sticks is key, as the former England hit-man has struck nine of the Black Cats’ 20 goals in 2016. While Sunderland are working their tails off, Arsenal look resigned to another safe but underwhelming top-four finish. They were painfully flat against Crystal Palace, settling for a point at home to a side they’ve beaten for fun over the last four decades or so. With a make-up fixture to negotiate on Thursday, the Gunners’ big hitters will need to dig deep to inspire an ever-more-agitated fanbase. It’s hard to say whether Leicester were lucky or unfortunate to draw with West Ham last week, but they need a steadier now as they look to defend a five-point lead over the last four rounds. The big news from that game was the controversial dismissal of Jamie Vardy, whose one-match ban could be extended if he’s found guilty of improper conduct towards referee Jon Moss. In complete contrast to the title-fighting Foxes, Swansea have very little to play for. Their drubbing at Newcastle last Saturday summed up what has been a frustrating season for the Welsh club, who are now well clear of relegation but unlikely to finish any higher than 10th. They rely heavily on Icelandic playmaker Gylfi Sigurdsson, who has scored nine Premier League goals since the turn of the year. Nobody can say Spurs don’t deserve to be at the pointy end of the title chase. They tormented Stoke last Monday, winning 4-0 despite Dele Alli missing one of the easiest chances he’ll ever have in his career. The Londoners have won 10 out of their last 13 fixtures, losing only once (to West Ham) in the process. As such, Mauricio Pochettino and his charges should fancy their chances against a West Brom outfit that is leaking points in the run home. The Baggies have lost three out of their previous four, but they’ve hit the 40-point mark and should be free of any relegation dramas. Worryingly for Tony Pulis, only Aston Villa (23) have scored fewer than West Brom’s 31 goals this season.